Turkish Riviera extends through eastern Mediterranean and the Aegean coastal waters which is one of the most frequented blue cruise grounds, starting from Antalya all the way to izmir which is geographically called the southwestern Turkish coastline. 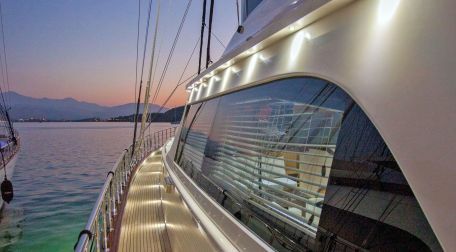 we as yacht charter turkey team take pride for being ready , willing and able to entertain any inquiry and accomodate our guests on our Motoryachts , gulets, sailing yachts whatever you might choose to charter in the vicinity of Turkish riviera and the neighbouring greek islands. the yachting season usually start in may through september and even october since the weather is still warm, and the seawater is warm and very calm. season is rather long compared to greek and/or Croatian summer season due to mainland anatolia generates favourable shelter from the Aegean weather generated by strong northwestern winds.